Unification of North and South Vietnam into the Socialist Republic of Vietnam. ↑ ক খ গ Agence France Presse 4 April 1995: "The AFP release...says that the Hanoi government revealed on April 3 that the true civilian casualties of the VN war were 2,000,000 in the north, 2,000,000 in the south. 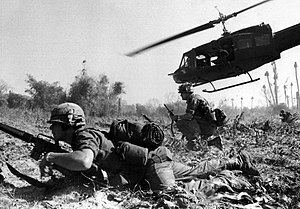 Military casualties were 1.1 million killed and 600,000 wounded in 21 years of war (1963–74). These figures were deliberately falsified during the war by the North VN nationalists to avoid demoralizing the population, according to the French article. " ↑ Dunnigan, James & Nofi, Albert: Dirty Little Secrets of the Vietnam War: Military Information You're Not Supposed to Know. St. Martin's Press, 2000, p. 284. আইএসবিএন ০-৩১২-২৫২৮২-X.